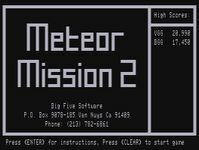 Meteor Mission 2 is an arcade style game for the TRS-80 that was inspired by the Taito arcade game Lunar Rescue. The game is also similar in concept to Lunar Lander (without the complex physics and limited fuel), but made more interesting by adding a rescue element. You descend through a moving meteor belt and attempt to land on one of several landing pads (which award a greater number of points the smaller the pad). If you avoid the meteors and land successfully, a stranded astronaut runs out from the side of the screen, enters your ship, and then you have to fire and navigate your way back through the meteor field and dock with the mother ship. The game was the fifth of seven arcade games programmed for the TRS-80 by Bill Hogue. Source: Wikipedia, "Meteor Mission II", available under the CC-BY-SA License. TRS-80 program by Bill Hogue and Jeff Konyu.